Once every couple of months or so, I cook my husband a really elaborate meal. 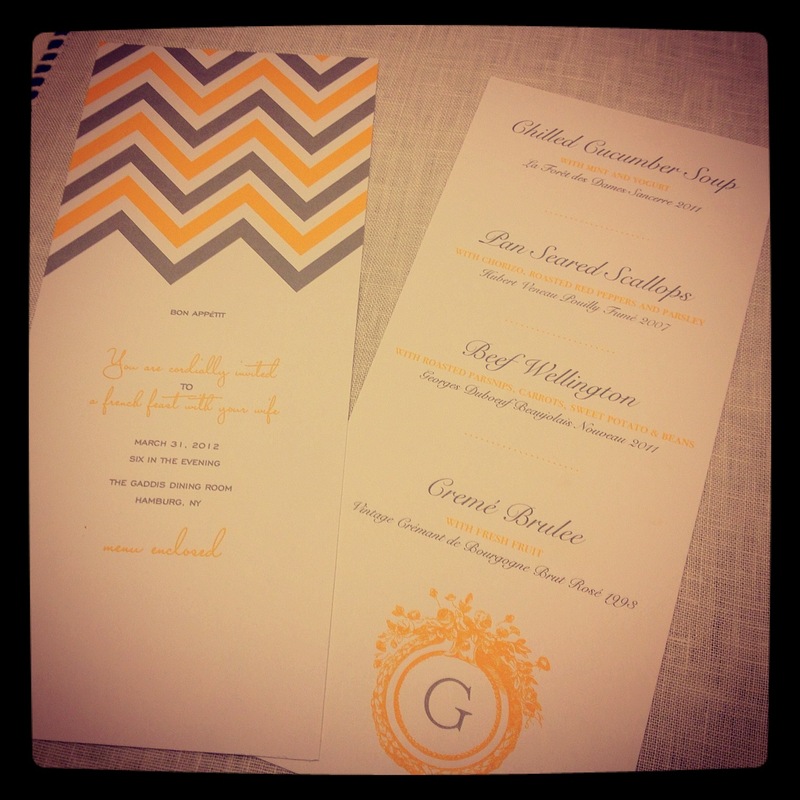 I plan a menu, send him an invitation, we eat while listening to operas and make a whole evening of it. It’s excessive, ridiculous, oh-so-cheesy and I love everything about it… my husband loves the food, the rest I think he just partakes in to placate me (Lol)! We had one of these dinners over the weekend and it worked out well because the weather was terrible all weekend so this gave us something to do. For the first course I served the chilled cucumber mint soup from my previous post, and this was our second course. I pan seared chorizo and scallops then drizzled them with a deliciously simple dressing and garnished them with a touch of roasted red peppers and parsley. Up until last year, I didn’t eat seafood… not because I didn’t like it but because I hadn’t really tried most of it and wasn’t eager to start. Luckily, I had a change of heart because the more I cook it, the more I love it. This dish was just a starter course for us so I made a small portion, but you could easily modify it to serve as the main course. Start by making the dressing for the dish. Combine 1/2 shallot finely minced, 1 1/2 tbsp olive oil and 1/2 tbsp apple cider vinegar in a small bowl and whisk together. 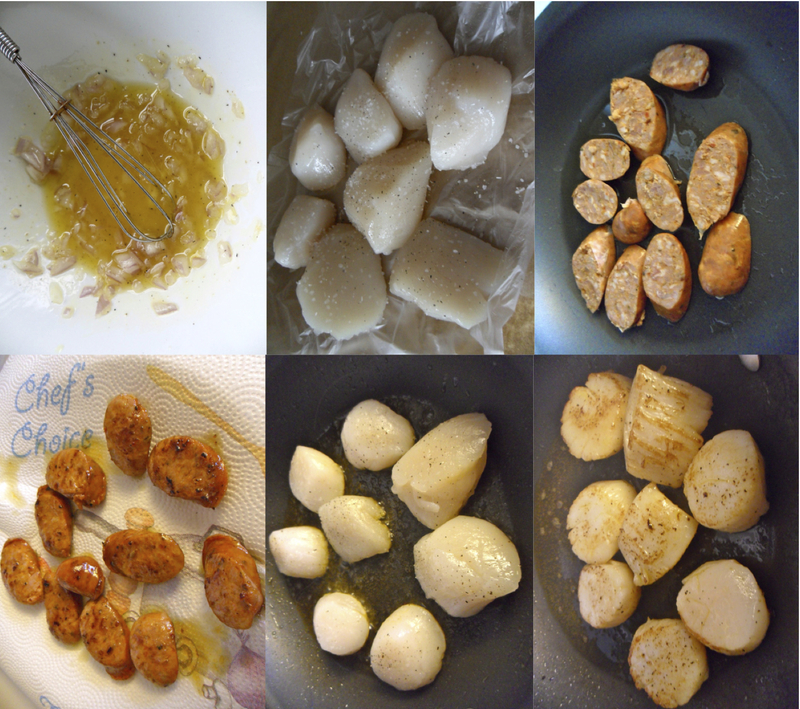 Season your scallops well on both sides (I used 8 scallops which equalled 1/2 pound). Heat up about 1 tbsp olive oil in a medium skillet over medium heat. Add in 1 1/2 chorizo sausages sliced on an angle and cook until brown on both sides. Remove from the skillet and set aside on a paper towel lined plate. Depending on how much grease your left with after cooking the chorizo, you may need to add a little more olive oil to your pan (you want enough to cover the bottom of the skillet). If you add in more oil, wait a few minutes to make sure it’s hot enough. Add in your scallops and cook for one minute on each side. 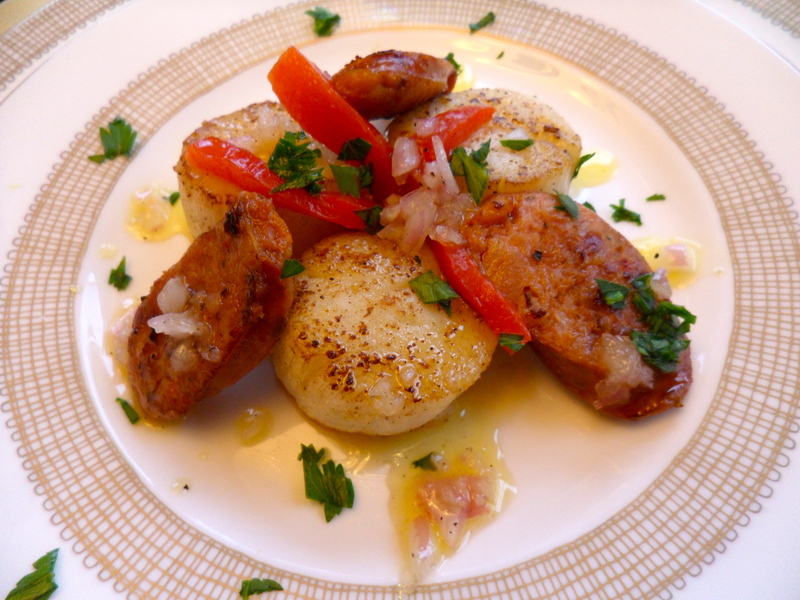 Take your scallops out of the pan and arrange them on your plates with the chorizo. Thinly slice some roasted red pepper and chop some parsley and sprinkle both over the dish. Drizzle with the dressing and you’re done! 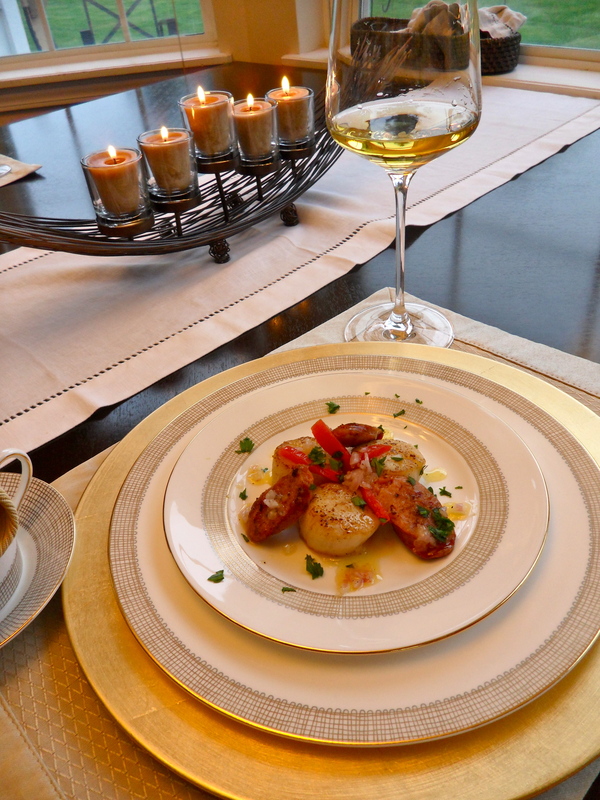 I served this dish with a 2007 Hubert Veneau Pouilly Fume, which is a french white wine, similar to a Sauvignon Blanc. Linda, this made my morning! So happy you were able to make and enjoy this as well as some of my other recipes! I know making scallops can be intimidating the first time so I’m happy they turned out!! Thanks so much!